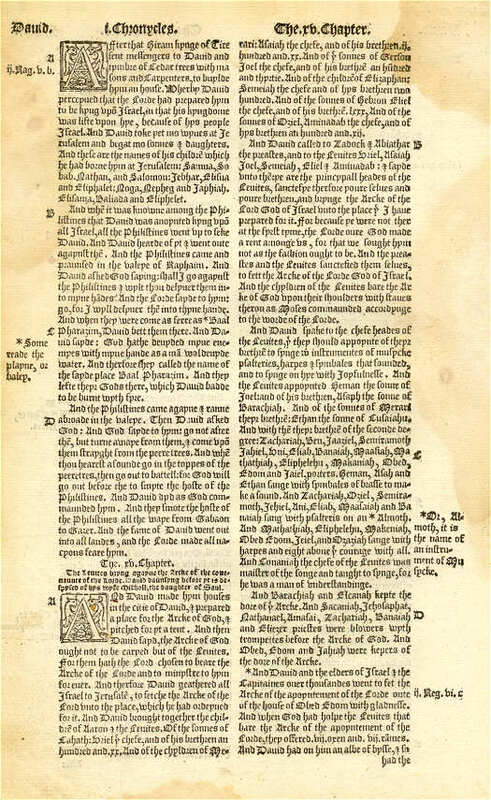 As you can see, there are no verse divisions in the text; they hadn't been developed yet. Instead, chapters were divided into 5 or 6 lettered sections called "lecterns" -- each chapter starting with "A". The 14th Chapter is divided into four lecterns -- "A" through "D". You can see these letters in the left margin. Under this notation, this page contains I Chronicles 14:a through I Chronicles 15:d.
Even though there were no verse numbers, cross references to other Scripture were included in the margins. Notice the last notation at the bottom of the right margin: ii.Reg.vi.c, which references II Kings 6:c.
If you are struggling to read the text -- join the group. The Old English typeface was certainly not chosen for ease of reading. Use the Menu on the left to view a closeup of another page from the Matthew Bible.